If you like this free game, try Zombie Shooter. After a technological disaster, most of the world's population is turned into zombies. The cities are in ruins, but a small percentage of people survived, and are now hiding in shelters. You one of the survivors. Your task is to protect your shelter from the crowds of zombies and bloodthirsty mutants. You have a wide arsenal of weapons and upgrades at your disposal. You can also improve barricades at the shelter entrance, or create machine-gun towers that are very efficient against crowds of enemies. Free Game features: - 45 levels; - 4 types of weapons and upgrades; - 4 types of upgrades for your shelter; - 7 types of enemies; - Atmospheric music and sounds effects. 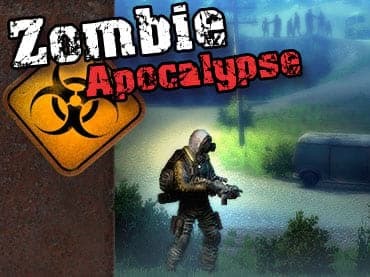 If you have questions about Zombie Apocalypse game, please contact us using this form.